Wednesday wasn’t cold and rainy, but it was grey and humid, so what could be better than spending the day wandering in and out of shops, and grabbing a bit of culture from some of the museums and galleries scattered around the place. I had two shops on my to do list – Hannah Zakari and the Red Door Gallery. I’m technically on a jewellery spending ban, but could not leave Hannah’s store without an I Am Acrylic necklace. I also wanted to buy ALL OF THE THINGS, but Husband was very tempted by a cute pug notebook, before remembering he has a proper serious job where that kind of thing isn’t appreciated. The Red Door Gallery was also amazing, but I couldn’t make a decision on what I wanted so left empty handed. Such regret. Obviously, Edinburgh has some great shops and I loved their old Jenner’s department store, where we found a beautiful ‘air force blue’ suit that’s gone on to Husband’s wishlist. I also window shopped many pairs of shoes, but is seemed to impractical to lug lots of shopping home on the train. 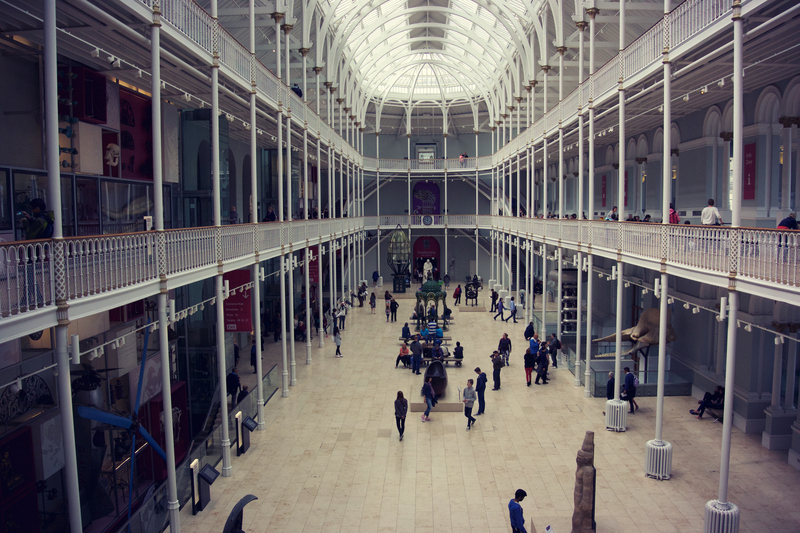 Another shop I loved was the one attached to the National Museum of Scotland. Of course I loved the actual museum as well. It’s huge, and we spent hours getting lost amongst all the exhibits. I couldn’t quite get my bearings at first as it only seemed to have odd numbered floors, but then we realised that there was a whole other bit filled with loads more stuff, and even that was with sections closed off for building works. It’s a gorgeous building though, and we were quite excited to realise that it had a Benugo coffee shop inside – we love Benugo! This was one of my favourite exhibits, which showed how other cultures deal with death. 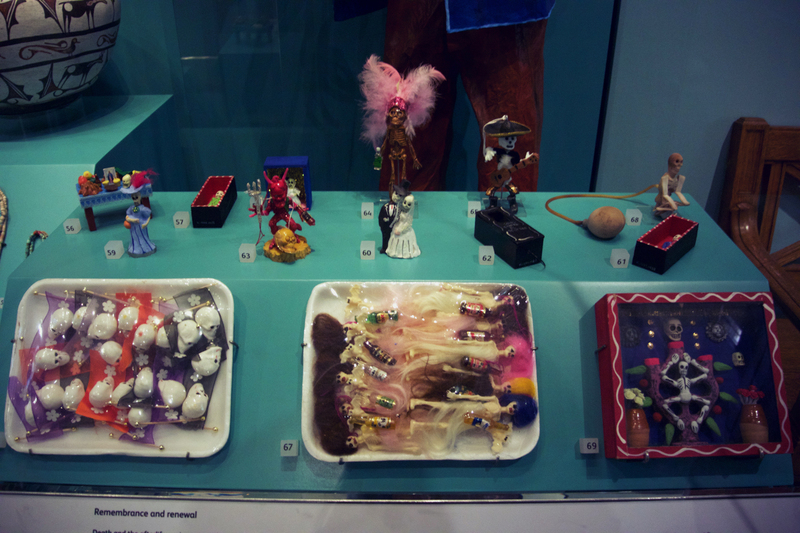 The Mexican Day of the Dead items were brilliant, and I love the pink glittery skeleton with feather headdress! After the museum, I wanted to see the Lichtenstein exhibit at the Scottish National Gallery of Modern Art. We went into what we thought was the Modern Art gallery, walked through several rooms of very old art, before realising we were in the wrong place. We scuttled across the road into another gallery which again, didn’t seem to contain modern art. An attendant rescued us from our confusion and showed us where we needed to be. Which was miles across town. Huh, more walking. To be fair, there was a minibus which would take you there, but we figured it wouldn’t take us too long, and it was a pleasant walk down through Dean Village again. Right on the top of Modern One (which housed the Lichtenstein display), was a lovely piece of neon by Martin Creed (Work No. 975). Oddly, Husband and I were to have a huge debate about Martin Creed, an artist who I love but the work displayed at Modern One properly enraged Husband. It was very amusing. Anyway, we were there to see the three rooms of Lichtenstein which featured the iconic In the Car, a few from his Water Lilies series, a few from Reflections (which were beautiful) plus a few more. It was so amazing to see them in person – they were so striking. Being able to look a them up close was such a treat. My other favourite room was the Pop Art collection, which featured Andy Warhol’s Portrait of Maurice (which is ADORABLE) and Duane Hanson’s Tourists – hilariously brilliant. I really enjoyed Modern One, and it was shame we didn’t get to Modern Two before closing time. We were also too early for the MC Escher exhibit (started at the end of the week) but we did see them building some insane wooden maze outside. Both the museum and the gallery were free to enter – go British galleries! 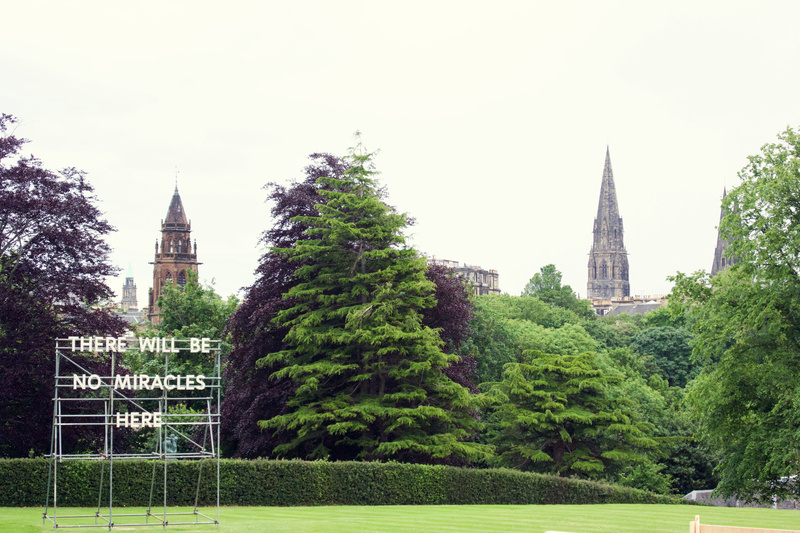 Before we started back to the hotel, I had just enough time to check out There Will be No Miracles Here by Nathan Coley in the grounds of Modern Two. Isn’t it beautiful. 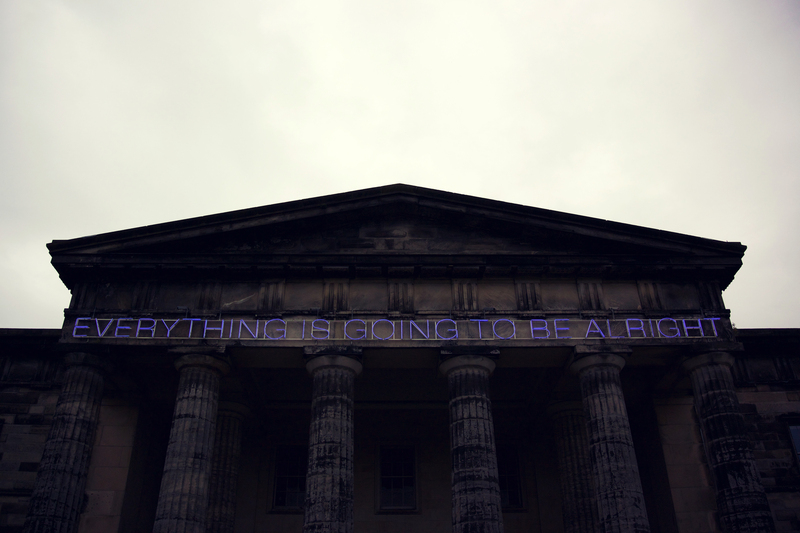 And that just about sums up our trip to Edinburgh.